Haircare isn't something I experiment with too often, because for me, many of them just overcomplicate my routine. I tend to use the same type of products and reach into my extended stash on the odd occasion that I'm really going for a specific style. Yes, I'm aware of how boring that is, but it's just what works for my super thick, weighty hair...it's sort of best without too much product. I am, however, always open to finding products that lean on the more natural side of the spectrum and still manage to produce results. Enter these beautifully packaged vegan, organic and all-natural hair products from Rahua. The gold accented packages, glass vials and exotic scents looked, and smelled, quite promising - not to mention that these products are beloved by an elite group of hair professionals for their ability to remain natural but produce amazing results. Read: the star ingredient in the haircare products is Rahua oil sourced from the Amazon rainforest. What's so special about this oil is that it has a smaller molecular structure than other oils used in haircare products, allowing it to penetrate deeper into the hair follicle, thus helping to repair hair and yield better results. 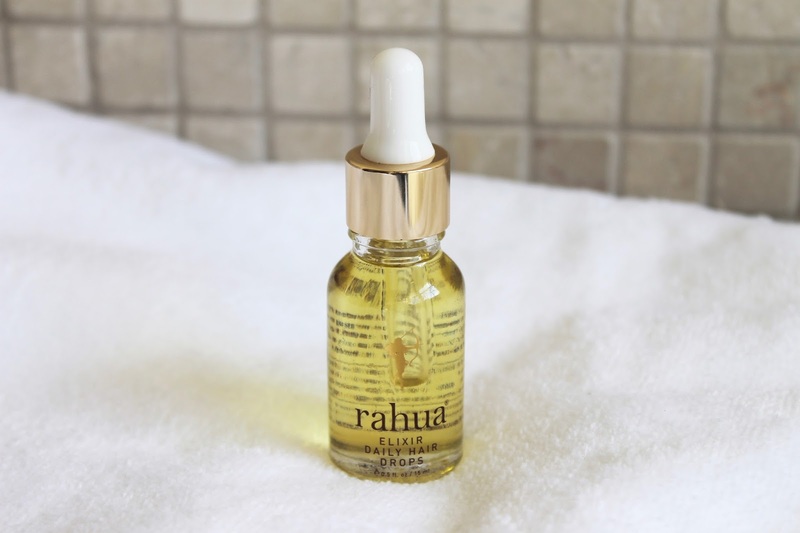 What's better is that Rahua even sources the oils according to the original practices of the indigenous men and women who have been using it for generations for it's regenerating properties. As I was saying before, I only factor a few categories of hair products into my daily routine. One of those is, of course, an hair oil - it's the one product I really can't go without. I've tried tons of them and each one is different, but none as deeply nourishing as the Rahua Elixir Daily Hair Drops. While some hair oils sit on top of the hair, upon first application you can really feel this oil absorb immediately into hair and give it a certain softness, shine, and over time strength. I have been using this daily (1-3 drops is all you need) and it has really helped my hair keep strong and my ends nourished while I'm trying to grow it out. The star ingredients are, of course, the Rahua oil, Palo Santo, and Gardenia enfleurage - a potent combination of strengthening oils, essential oil for a calming experience, and antioxidants for protection. Safe to say, I'm addicted to this stuff, and I love how portable and easy it is to pack for travel as well. 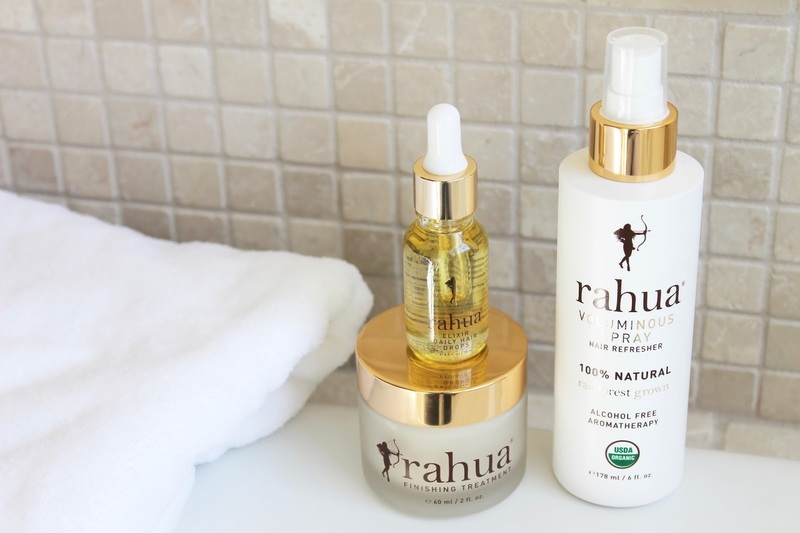 The Rahua Voluminous Spray is another product I've been loving from the brand. It contains a refreshing blend of citric juices for soft hold and oil breakdown, lemongrass for body, eucalyptus for clarifying, and lavender for it's therapeutic properties. I've been reaching for this product non-stop to give my hair pick-me-ups throughout the day and to help extend the time between washes and add soft, swishy volume thanks to the citrus blend. I also love how the fresh scent helps to really perk me up when I'm feeling tired. Who doesn't love a good bonus? 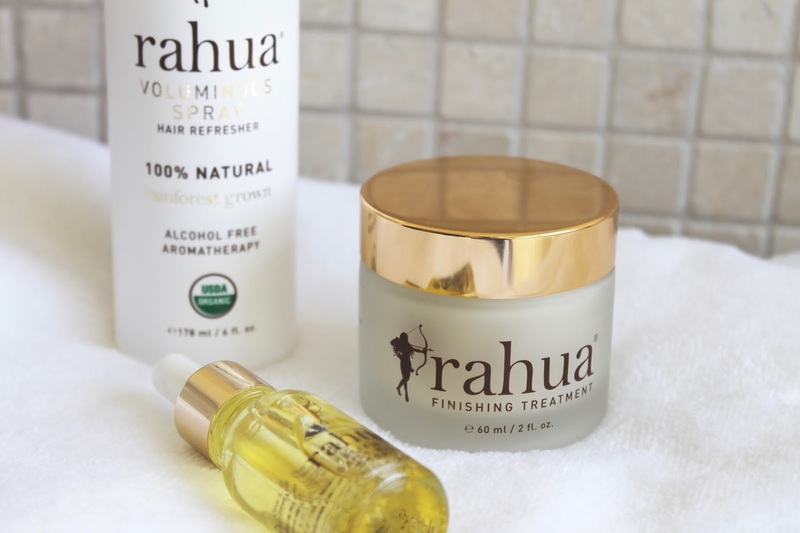 Of course, I also love a good finishing product and the Rahua Finishing Treatment has become another daily hair grab. After I wash my hair I use just a dime-sized amount and distribute through my ends for heat protection and for an added hit of moisture. 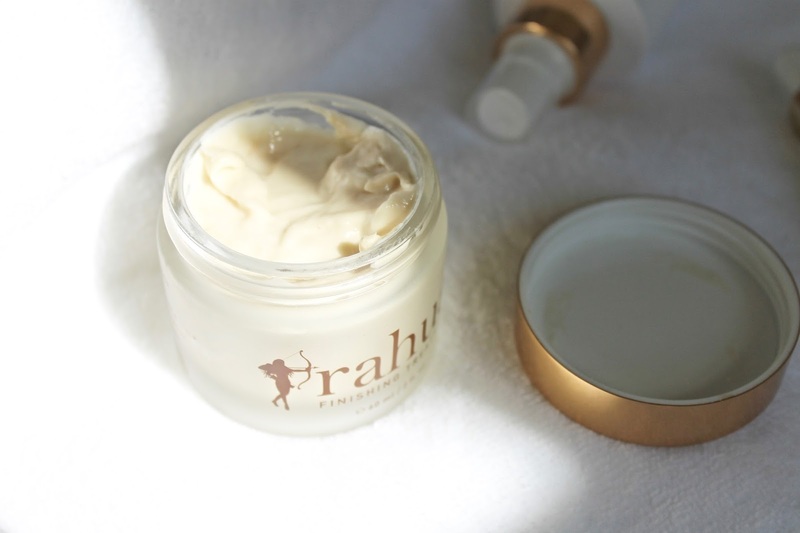 It contains an omega-rich blend of Rahua oil, Palo Santo, Quinoa, Green Tea, and Raspberry leaf extract. I love how soft and swishy this makes my ends look and how well it helps hot tools glide over my hair. All of these products are deeply nourishing and since using them my hair feels noticeable stronger, looks shinier, and I've experienced less breakage when using heat styling tools which is a real feat, especially considering I've been trying to grow my hair long. I've got my eye on the shampoo and conditioner duo next; have you tried Rahua hair products before?